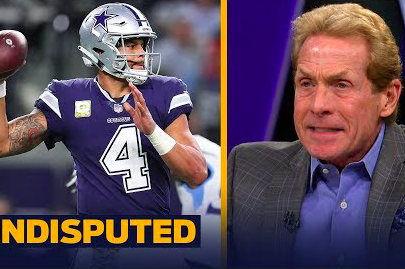 Skip Bayless reacts after the Dallas Cowboys' 28-14 loss to the Tennessee Titans on Nov. 5, 2018 at AT&T Stadium. Yesterday, it was Stephen A. Smith. Today, it was Skip Bayless. Both days, the Cowboys were awful. The former "First Take" partners each had their own powerful and unhinged reactions to the plight of the now 3-5 Dallas Cowboys. Bayless is a lifelong Cowboys fan and usually wears that critical blindspot proudly and foolishly. Monday night's 28-14 loss to the Tennessee Titans — at home — was his final straw for the 2018 NFL season. Humbly seated before Shannon Sharpe on "Undefeated," Bayless tore the Cowboys apart in glorious fashion. All the passion of every bitter and delusional thing he's ever said about the Eagles finally was invested in a tour de force condemnation at his own altar. "I would like to announce I can no long defend 'my' Dallas Cowboys," Bayless began. "In fact, it's very hard for me to say the words 'my.' I think they're just 'the' Dallas Cowboys because what we saw last night at Jerry World was exactly what the record says we saw." And then Bayless dissected everything we saw, from Titans safety Kevin Byard running an interception out to the star at midfield to Dak Prescott forcing red zone passes to next year's first round draft pick, Amari Cooper. The best part about this is that it beautifully sets up Sunday night's showdown against the Eagles at Lincoln Financial Field. Odds are, Bayless will be walking this emotional outburst back by Friday. The record is being preserved here for the return of his misplaced confidence.